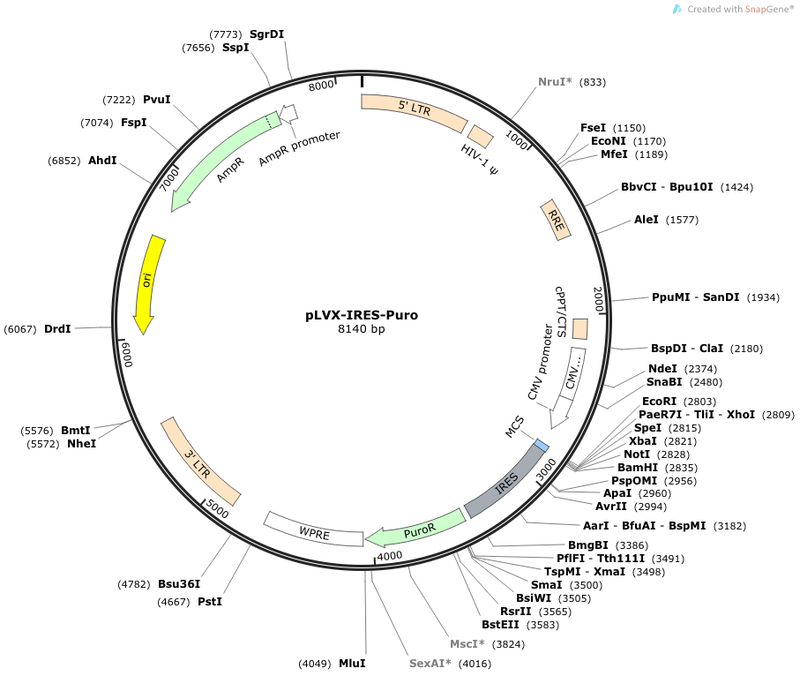 pLVX-IRES-Puro is an HIV-1-based, lentiviral expression vector that allows the simultaneous expression of your protein of interest and puromycin resistance (Puror ) in virtually any mammalian cell type, including primary cells. The vector expresses your protein of interest and Puror from a bicistronic mRNA transcript, allowing puromycin resistance to be used as an indicator of transduction efficiency and a marker for selection. Expression of the bicistronic transcript is driven by the constitutively active human cytomegalovirus immediate early promoter (PCMV IE) located just upstream of the MCS. An encephalomyocarditis virus (EMCV) internal ribosome entry site (IRES), positioned between the MCS and Puror , facilitates cap-independent translation of Puror from an internal start site at the IRES/Puror junction (1). 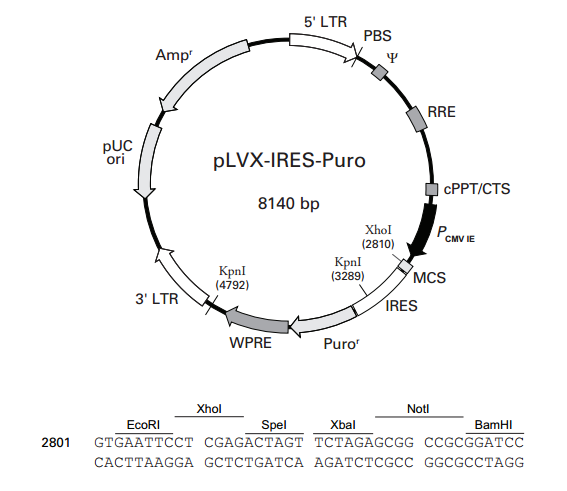 pLVX-IRES-Puro contains all of the viral processing elements necessary for the production of replication-incompetent lentivirus, as well as elements to improve viral titer, transgene expression, and overall vector function. The woodchuck hepatitis virus posttranscriptional regulatory element (WPRE) promotes RNA processing events and enhances nuclear export of viral RNA (2), leading to increased viral titers from packaging cells. In addition, the vector includes a Rev-response element (RRE), which further increases viral titers by enhancing the transport of unspliced viral RNA out of the nucleus (3). Finally, pLVX-IRES-Puro also contains a central polypurine tract/central termination sequence element (cPPT/CTS). During target cell infection, this element creates a central DNA flap that increases nuclear import of the viral genome, resulting in improved vector integration and more efficient transduction (4). The vector also contains a pUC origin of replication and an E. coli ampicillin resistance gene (Ampr ) for propagation and selection in bacteria. pLVX-IRES-Puro is available as part of the Lenti-X™ Bicistronic Expression System (Puro; Cat. No. 632183). The vector is designed to constitutively coexpress your protein of interest and puromycin resistance from PCMV IE when transduced into mammalian cells. Before it can be transduced into target cells, the vector must be packaged into viral particles in HEK293T cells, using our Lenti-X™ HT Packaging System (Cat. Nos. 632160 and 632161). This packaging system allows the safe production of high titer, infectious, replication-incompetent, VSV-G pseudotyped lentiviral particles that can infect a wide range of cell types, including nondividing and primary cells (5).